Studies designed to assess breast implant safety, including local and systemic complications and illnesses related to breast implants, will be considered. The ASE/PSF Combined Research Grant is intended to fund a research project that will advance the scientific knowledge and aim to develop and validate new methods of surgical care. The PSF recognizes the importance of promoting innovative research in hand surgery, academic plastic surgery related to research, peripheral nerve research microsurgery, and stimulating fundamental research in plastic surgery. The PSF Pilot Research Grant is intended to support residents and junior faculty in their efforts to address focused research questions, obtain preliminary data to support larger grant proposals in the future, and develop a line of research that can be carried forward into an academic career. 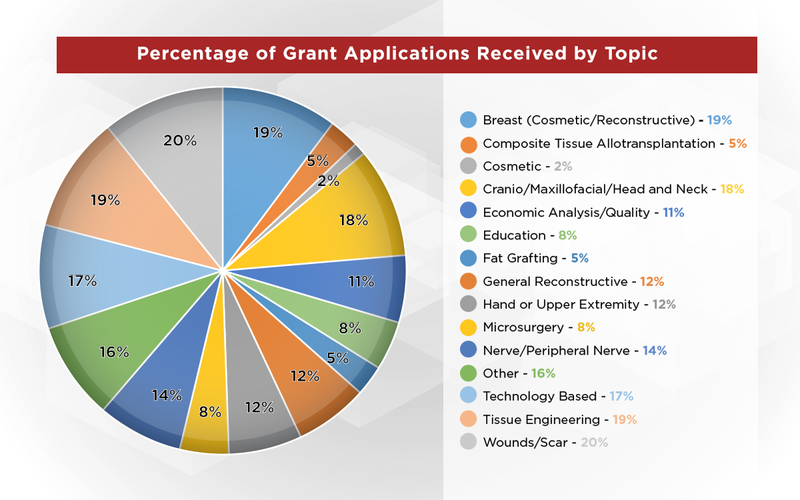 The National Endowment for Plastic Surgery Grant is intended to support research projects which translate clinical or basic science research findings into clinically relevant advancements or tools with a high likelihood of impacting daily practice and patient care within the next few years. The PSF supports investigators from the beginning of their careers, during residency and as they advance to becoming experienced and well-established plastic surgeons. This grant was developed and is being offered this year in memory of ASPS Past President Scott Spear, MD and the Spear family's desire to nurture and grow the training and expertise of young academicians considering a career in breast reconstruction and patient care. The PSF and MTF Biologics offer research grants to investigators studying allograft tissue transplantation in plastic and reconstructive surgery. The goal of this program is to accelerate the translation of scientific discoveries and technical developments into practical solutions that improve human health through innovation funding, and to encourage collaborative, transdisciplinary work to accelerate the translation of medical discoveries into improved health.